Most twelve-year-old’s idea of a crazy project is building a Lego car or a tree house. Mine was to build a backyard foundry. I’m not sure where I got the idea from, but I think it was seeing an advertisement for Dave Gingery’s series of books in the back of Popular Mechanics. Dave Gingery created a whole series of instructional booklets and plans for the home machinist. He had books on how to build just about any piece of equipment from lathes to band saws to foundries. 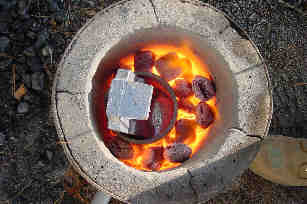 The Actual furnace was made from a large popcorn can lined with a sand/fire clay mix, and heated with charcoal. 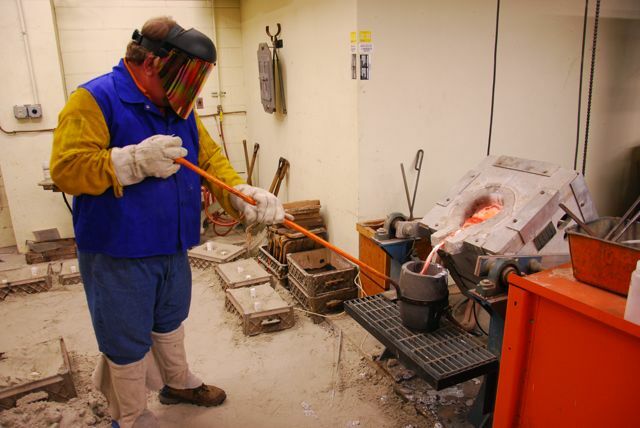 We used a blower motor from a discarded dishwasher to raise the furnace temperature high enough to melt aluminum. My dad came up with the clever idea of using a stainless steel camping mug as a crucible. The end result was pretty similar to what you see below. I have pictures of my actual furnace that I need to scan and post. The fact that they are on film should date this project pretty well. The biggest challenge at the time was mold making. 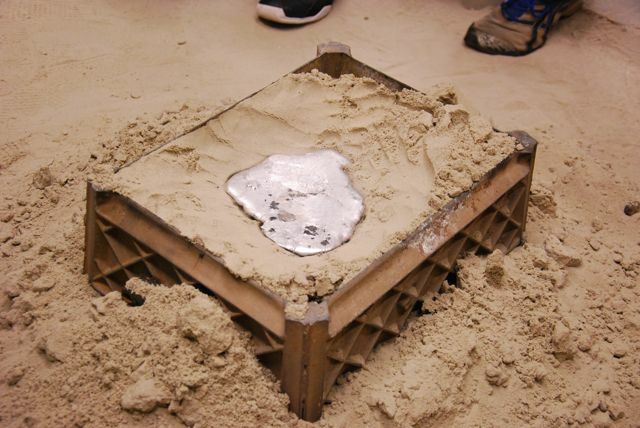 I lacked critical components, namely casting sand, cope and drag molds, and parting dust, so I was limited to making impressions in a bed of sand then filing them with molten aluminum, which was still pretty cool. 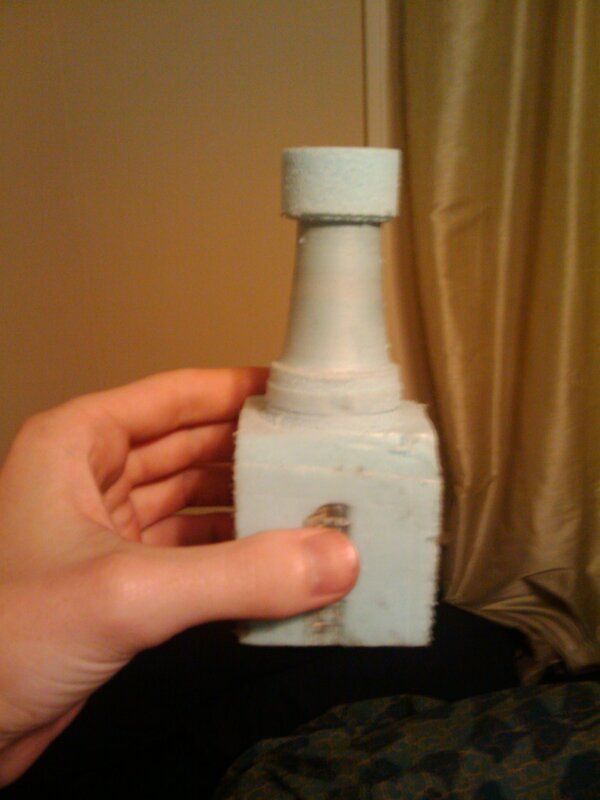 If I had known about lost foam casting at the time, I would have been able to make complex shapes easily. Now that the trip down memory lane is over, lets move on to recent events. 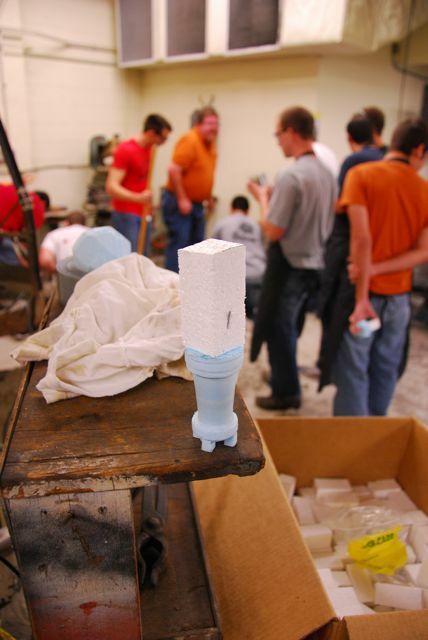 My machine shop class assigned a casting project using the lost foam casting process. 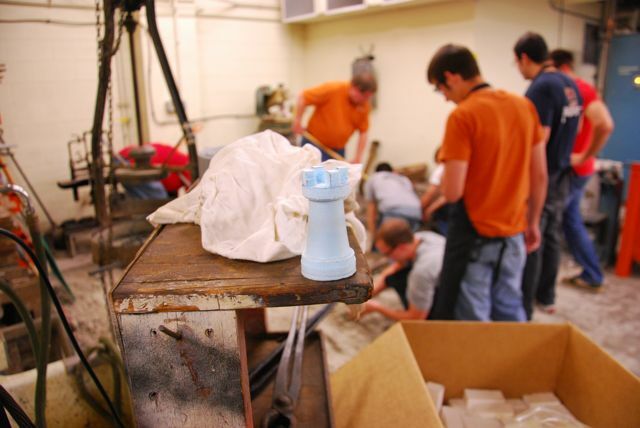 This casting process uses expendable foam molds that are covered in sand. 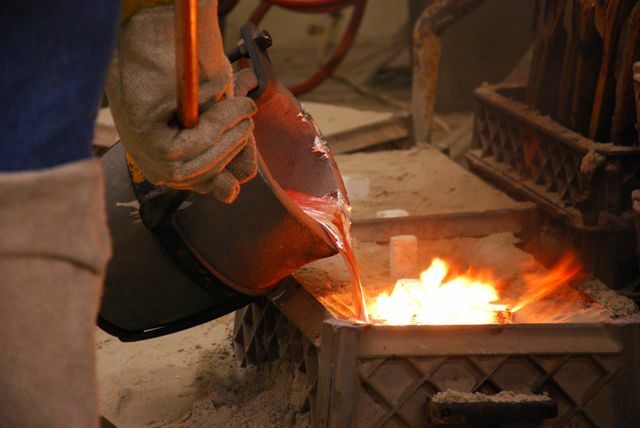 Molten metal is poured in, evaporating the foam and replacing it with metal. The name derives from the fact that the foam is burned up, ie lost, in the process. You can make much more complex shapes with lost foam casting than you can with the standard cope and drag method. We made our patterns from 4″ extruded polystyrene, aka blue home insulation. We had a hot wire cutter available to us, but I decided I wanted to do something a little different. When I asked if I could turn foam in a lathe the response I got was a resounding “probably?” So I threw caution to the wind and chucked in the lathe. With successive passes the foam block became loose in the chuck and started to wobble, eventually falling out. Fortunately it simply fell into the chip tray, rather than becoming a deadly hurty projectile. Sliding the tail stock over and using a live center stopped the wobbling issue. 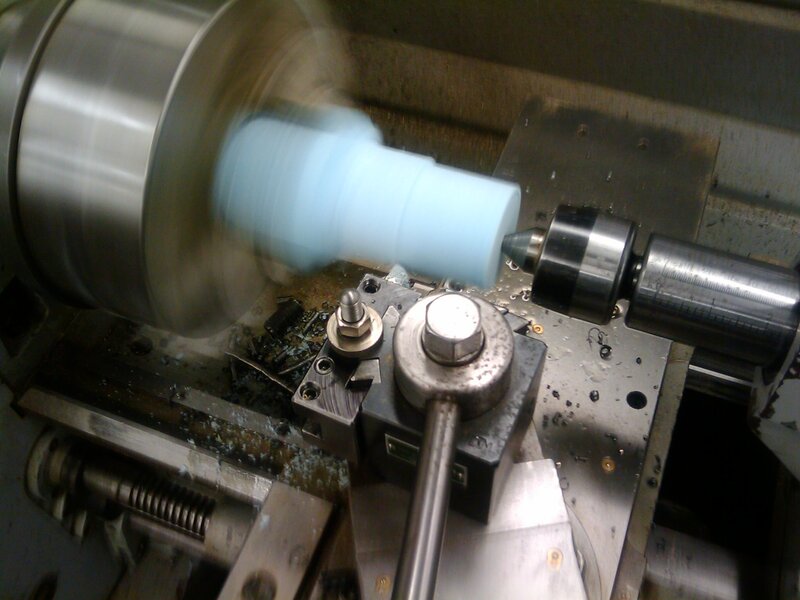 The foam machined surprisingly well on the lathe, I don’t remember the exact speed, but I believe it was around 400 rpm. 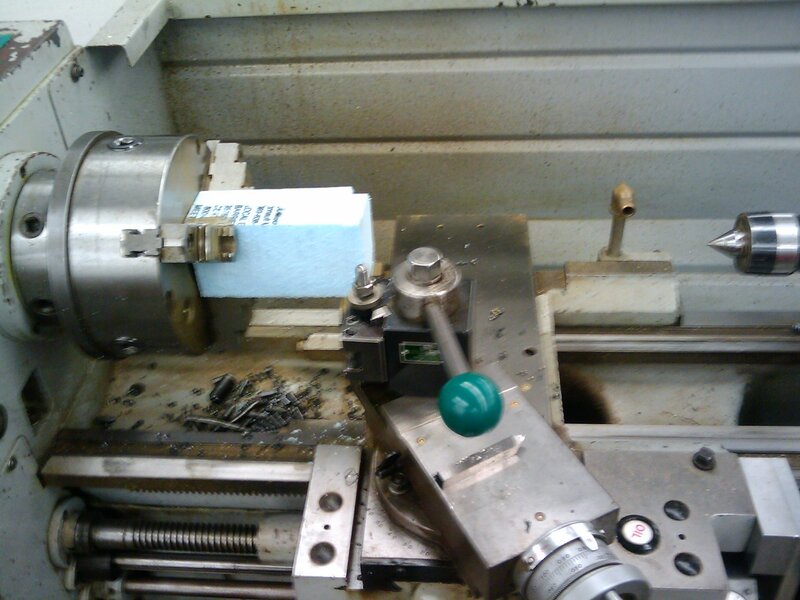 After a dozen or so passes I had reduced the cube to a cylinder and began machining the features. 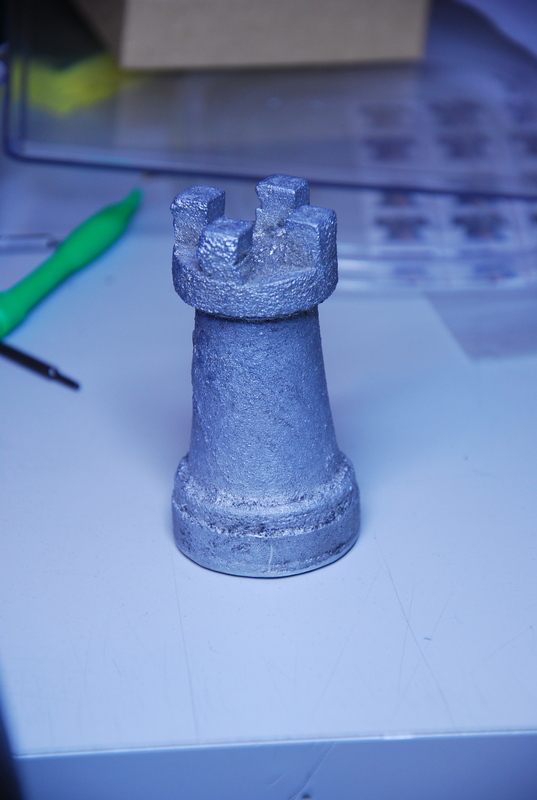 It’s a Rook (the chess piece that looks like a castle). I carved the rest of features using an exacto knife. Here’s the final pattern waiting to be cast. 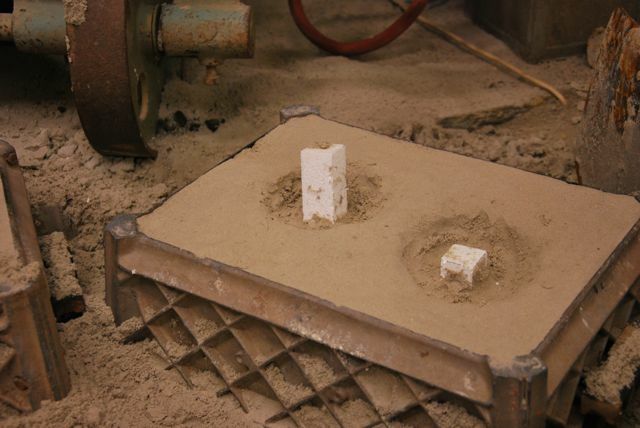 The white block is a piece of beaded polystyrene foam that forms the sprue. 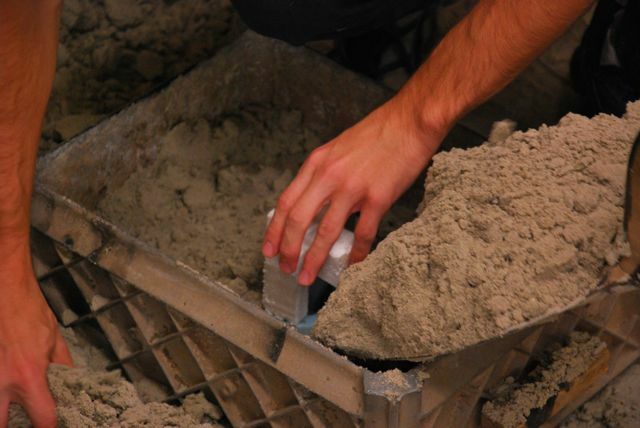 The patterns are placed in the forms and filed in with casting sand, which was a mix of silica sand, bentonite clay, and water. 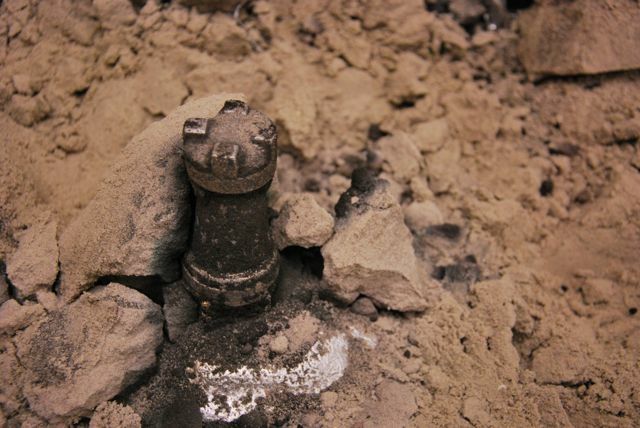 A small well is dug around the sprue to contain the excess metal. 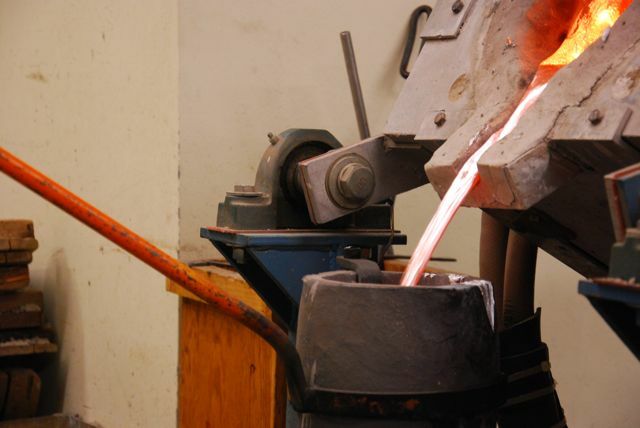 In casting you always want to control where your molten metal goes, as a stream of 1200 degree metal flowing randomly can do lots of damage very quickly. 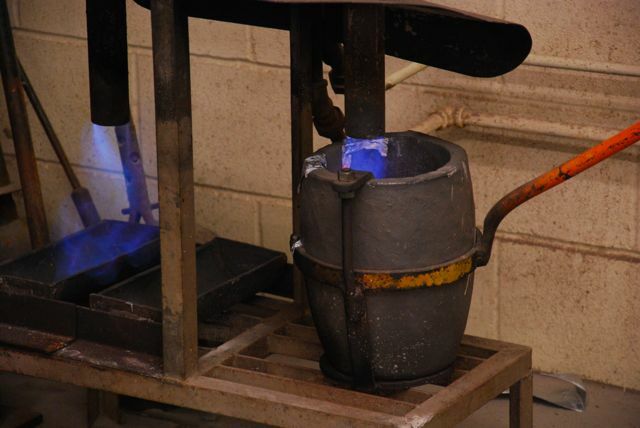 The casting shop uses an induction furnace to melt metals. 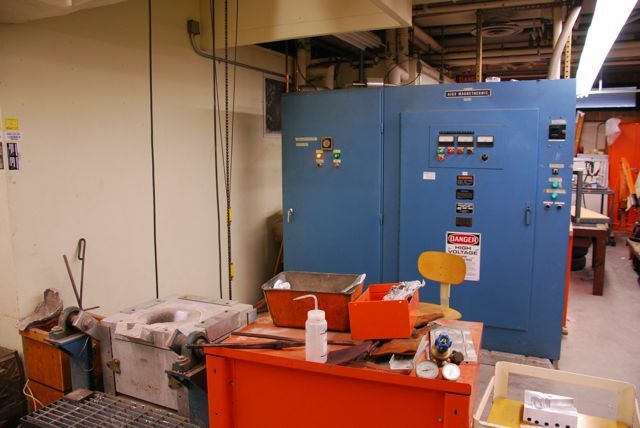 The small gray block on the left is the actual furnace, and the enourmnous blue box on the right is the power supply that conditions the current necessary to run the furnace. The system consumes something like 600kW and emits an ominous, high-pitched whine due to magnetostriction. Try and incorporate that word into a conversation this week. 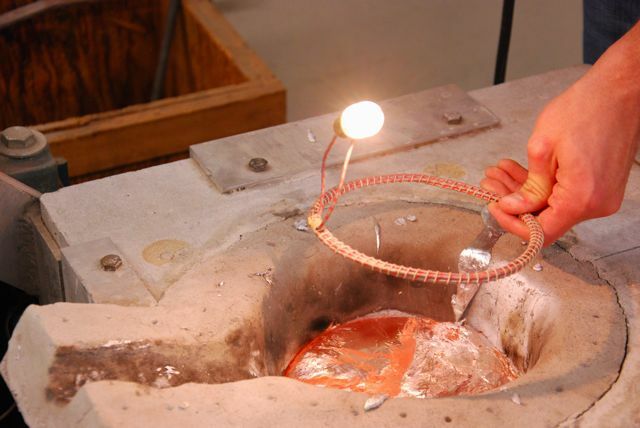 Passing a coil of wire over the furnace induces a current in the wire, which lights the bulb. 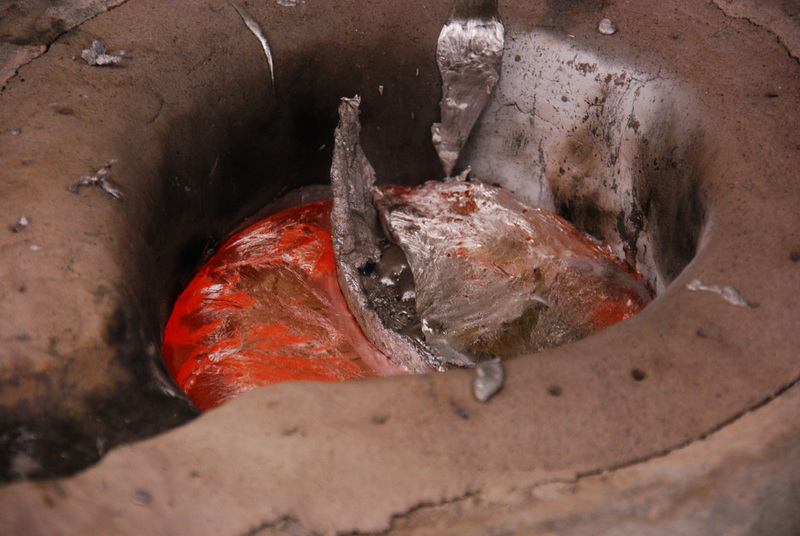 The crucible is preheated to keep the aluminum hot enough to make multiple pours. The rough casting emerges from it’s sandy cocoon. The end result, after cutting off the sprue and grinding the base.